Privacy concerns and privacy controls on Facebook are ever changing. When you post a picture of your kids at a family gathering, which one of your Facebook friends can share it? What private information are those Facebook game apps collecting on you for "third-party uses"? How do you make sure that live video stream is seen only by people you choose? Every action you take on Facebook has privacy and sharing implications that need to be considered before you upload that next selfie. Fortunately, thanks to vocal demands for transparency from both Facebook users and government regulators around the world, Facebook has been making the process of managing your privacy easier. 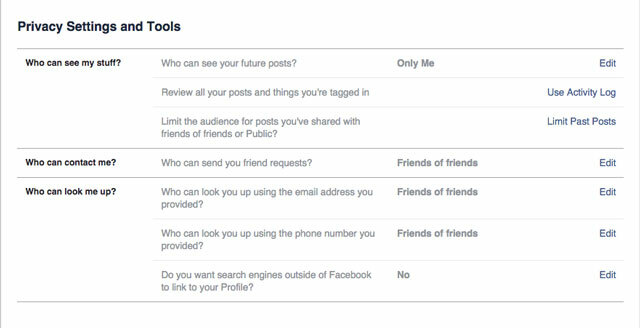 Below is our step-by-step guide to taking full control of your Facebook privacy settings. If you’re not ready to dive into Facebook’s substantial settings menu, there’s a more user-friendly guide through the more vital privacy settings. 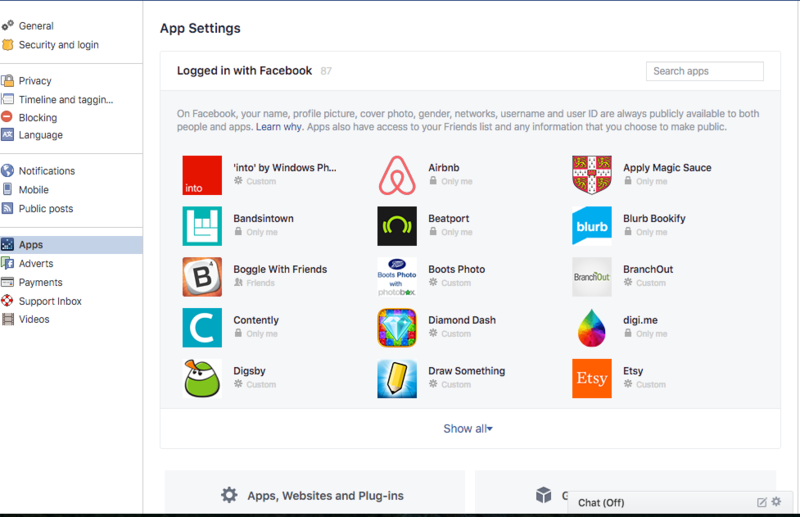 Click on the question mark symbol in the top right of any Facebook page when you’re logged in, and select Privacy Check-up, an easy-to-follow walkthrough of your current settings as they pertain to "Posts", "Apps" and "Profile". Starting with Posts, you can check your default sharing setting. We recommend the Friends setting over the Public one. 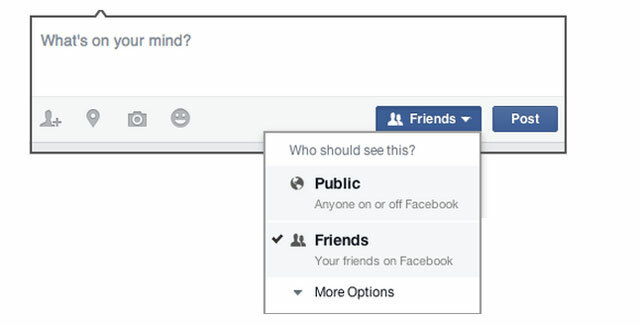 When set to Public all your posts can be seen by anyone on or off Facebook. Unless you're a celebrity or running a page that is used to generate interest in a business you run, you will likely want to keep your activity restricted to those you have Friended. The Friend setting has a few tweaks you should be aware of as well. By clicking on the sharing setting button, then the More Options button, you will see the Custom option. Click on that and you will see that you can include all your Friends while excluding the names of certain Facebook friends you don't want to see your updates. It is also important to note that the Friends of anyone tagged in your post or photos will be able to see that post unless you uncheck the option in this window. If you have joined any Facebook groups or made lists of Facebook friends, you can restrict the posts that way or hide your posts from those groups and lists as well. Want just your college friends to see your late night party pictures? Want to make sure your work friends don't see your selfie at the beach when you called in sick? This is where these restrictions could come in handy both on a per post basis or as an overall option. Finally, remember that you can change the sharing settings of any individual Facebook update by clicking on the sharing button to the left of the Post button. You can even go back to change settings of previous posts by clicking on the people icon at the top of the post, to the right of the date stamp. Remember the Candy Crush Facebook game you played too much last year? How about that Instagram Facebook app you forgot you installed? Each app on the site you agreed to install has permission to post to your Friends list unless you told it otherwise at the time you installed it. Can't remember? This part of the tool shows you each app attached to your account and what sharing permissions it has. These settings also control who can see that you have the app installed. If you don't use the app anymore, just delete it by clicking on the x. While checking my own app list while writing this guide, I found many apps I no longer use that had sharing rights on my account. I deleted all that I'm not actively using and set the sharing permissions of the remaining ones to Only Me. Here you can see the privacy setting on your email addresses, birthday, hometown, relationship status and other personal details about your life. Under emails it will show the one you registered with when you first signed up for Facebook as well as one Facebook has assigned to you (which you likely will never use). I discovered that I left my Gmail account public, which I hadn't meant to. For your birthday, the sharing settings are split between the day/month and the year. That way your Friends can wish you happy birthday on Facebook on your special day without necessarily knowing your exact age. For hometown, this setting only affects what your Friends can see. Advertisers and others may still access this information, especially if you are using the Facebook app which tracks your location automatically. Finally, if you have set a relationship with another Facebook user, it will be shared unless you set otherwise. It's important to note that this is only a partial list of the information you're sharing. To see the full list, click the My About Page button, which will take you to your profile page. On there, you can review the various sections—Work and Education, Places You've Lived, Contact and Basic Info, Family and Relationships, Details About You, and Life Events —and make changes hovering over each and clicking the link that appears. Here you can exert more control of what is being shared with whom. Which is never a bad idea. You've likely gone through this at least once in the past, but it's a great idea to review your settings at least once a year. To get to the advanced privacy settings, click the drop down arrow in the top right on any Facebook page, click "Settings," and then "Privacy" in the left navigation column. Who can see your future posts? This is the same as the Your Posts section above. Review all your posts and things you're tagged in Ever been tagged in an embarrassing photo uploaded by that distant college classmate? You can use the Activity Log page and select the Posts You're Tagged In (in the left column) and the Photos > Photos of You (also in the left column) to check out what you've been tagged in. You can then remove the tag (click the dropdown arrow on the left of the post or photo and then click on the the Remove Tag button at the top of the page) or simply click Hide so they don’t appear on your Timeline. Review your other activity on Facebook. Hitting “More” after Photos, Likes and Comments reveals other items that may have been automatically posted to your Timeline and your friends’ news feeds, including friends made, events attended, and videos watched (these are embedded video posts that are separate from video apps, and isn’t controlled from the Apps menu above). Some of these, such as friends made, can only be tweaked to be allowed or hidden on your Timeline. For “videos watched”, you can hover over the padlock to view who can see that you’ve watched it, or choose to delete the post. You can also Clear Video Watch History at the top of the page, and manually update privacy settings by individual posts from music, news and games apps. Click on each section to make sure that the audiences for every category of activity is ok with you. Limit the audience for your old posts for your Timeline This will revert all your previous posts from "Public" or "Friends of Friends" to just "Friends". But if you've tagged a Friend in one of your posts, their Friends can see that since that is the default setting when tagging someone. Facebook Live – private, friends or public? For live video stream posts from your smartphone, the default setting for each video stream will be the privacy level you set for regular posts and photos. You may want to be a little less selective for live-stream video if you’re shooting something news-worthy (or if your plan is to go viral), or more selective when you’re just testing something out. Either way, fire up the usual status update and select Live Video or the little red person icon. If it’s your first time, you’ll also want to grant Facebook permission to access your camera and microphone. You’ll see your name and profile pic and underneath, the permission level for the video. Tap to edit and select an audience from options of Friends, friends minus a couple no-no’s for reasons of your own, or public to be viewable by anyone on or off Facebook. If you run a Facebook Page and have professional video software or hardware (more information here) you can also stream from your computer, but as you’re assumed to want to reach your usual audience, there’s no option to tweak post visibility separate to your regular posts. Who can send you friend requests? The default is Everybody, but the only other choice is Friends of Friends. Who can you look you up with the email address you provided? If someone types in the email address you registered with, they can send you a message which will likely land in the Other tab on the Messages page. You can restrict it to Friends of Friends or just Friends (who can message you anyway), if you don't want to be bothered. Who can look you up using the phone number you provided? Same as the email address. Do you want other search engines to link to your timeline? Your first impulse may be to turn this off, but Facebook only allows information you've marked as Public to be shown to other search engines. They see it as a way for friends not on Facebook to find you. They do this with your basic information they always make public which is, according to Facebook, "...your name, gender, username and user ID (account number), profile picture, cover photo and networks." Whatever you choose for all three of the above settings, anyone will still be able to find your profile simply by looking up your name in Facebook search. Now that you've mastered the basics, go down to the next section, Timeline and Tagging. From there, you can control exactly who sees what on your timeline, who can post to your timeline, and who can tag you in photos and posts. To customize your timeline settings, click on the down arrow in the far upper right corner to reveal a drop-down menu and select Settings. Who can add things to my timeline? Who can post on your timeline? It's set by default to Friends and the only other option is to allow only yourself to post on your timeline. Who can see things on my Timeline? Review what other people see on your Timeline. Click “View As” for the perfect way to check that your mother or boss won't see what you don't want them to. Who can see posts you've been tagged in on your Timeline? These areas give you a great deal of flexibility, with options ranging from Everyone to Friends of Friends to custom lists. Using this and the below setting in conjunction with manually approving what photos and updates you've been tagged in goes a long way to keep prying eyes away from more sensitive Facebook updates. Who can see what others post on your timeline? As above, you have flexibility with options ranging from Everyone to Friends of Friends to custom lists. Using this in conjunction with manually approving what photos and updates you've been tagged in goes a long way to keep prying eyes away from more sensitive Facebook updates. How can I manage tags people add and tagging suggestions? Review tags people add to your own posts before the tags appear on Facebook? This is an important option if you are concerned about a photo appearing on your profile. This applies only to photo tagging by your Facebook friends. You'll always be notified if someone who's not your friend tags you in a photo. When you're tagged in a post, who do you want to add to the audience if they aren't already in it? This one sounds more complicated than it is. Often a Facebook friend of yours will make a post and tag you in it. The option here allows all of your Facebook friends to see an update or photo you've been tagged in by someone they aren't friends with themselves (the Friends of Friends function). You can choose to remain tagged but have none of your other Facebook friends see that update, limit who sees that update to certain groups of friends, or you can outright block certain Facebook friends altogether by using the Custom option. Who sees tag suggestions when photos that look like you are uploaded? Facebook uses face-matching technology to suggest who you should tag in photos. It will only suggest people that are on the user's friends list. If you don't want to show up as an option when your friends are tagging photos, set this to No One. If you want to take steps to keep people away from your profile, this is the section for you. If you don't want to un-friend somebody but also don't want them to see all of your information, you can add them to the Restricted List. This means they can see your public information, but they have no way of knowing you’ve limited their view (unless they happen to see someone browsing your profile who isn't restricted). You can also just straight up block somebody. This means this person cannot be your friend. This is an excellent setting if you have stalkers or other people consistently bothering you. Note that this does not stop them from interacting with you in apps, games or groups you're both a part of. Block messages If you’re receiving unwelcome messages and video calls from someone, you can put a stop to that here – and it carries over to the Messenger app too. However, the pest in question will still be able to post to your Timeline unless you block them as a user (above). 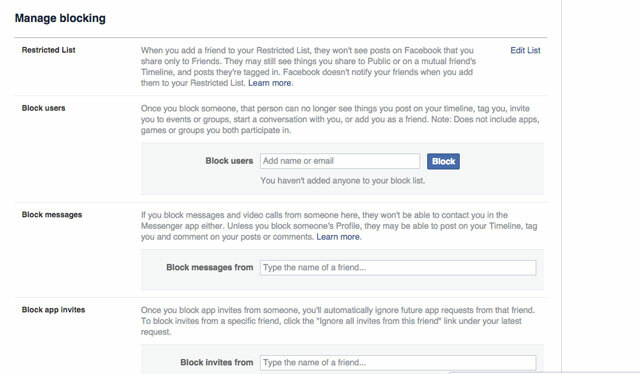 In addition to blocking and restricting people from your profile, you can also block app invitations on a user-by-user basis. So if your Aunt Jackie keeps bombarding you with FarmVille apps, you know what to do. Tired of your nephew inviting you to his New York City raves every weekend? Typing the name of the Facebook user into this section will stop you from seeing any future event invites from that person. Some apps and Facebook games are great fun at first, but after a while, you want to drop them. 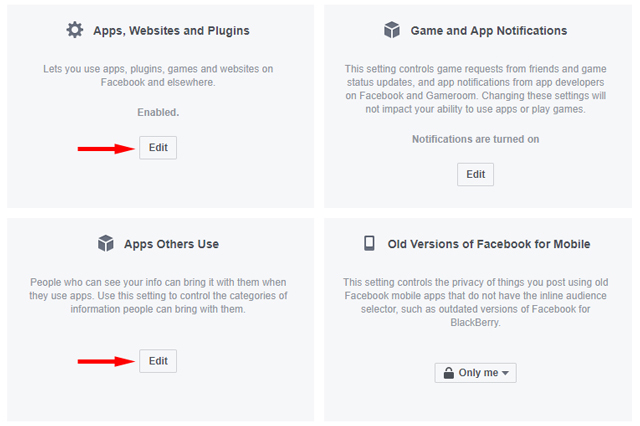 You can remove the app or game (see the Apps you use section, below) or block the app, which means it can no longer contact you or get non-public information about you through Facebook. If you are getting emails from the app, you will have to use the unsubscribe link at the bottom of the email. Is that discount fashion site you liked bombarding you with updates from its Facebook Page? Block ‘em here, where you’ll also automatically unlike and unfollow the Page. You can also block other Pages (i.e., public pages for businesses and celebrities) from commenting on or liking your posts. 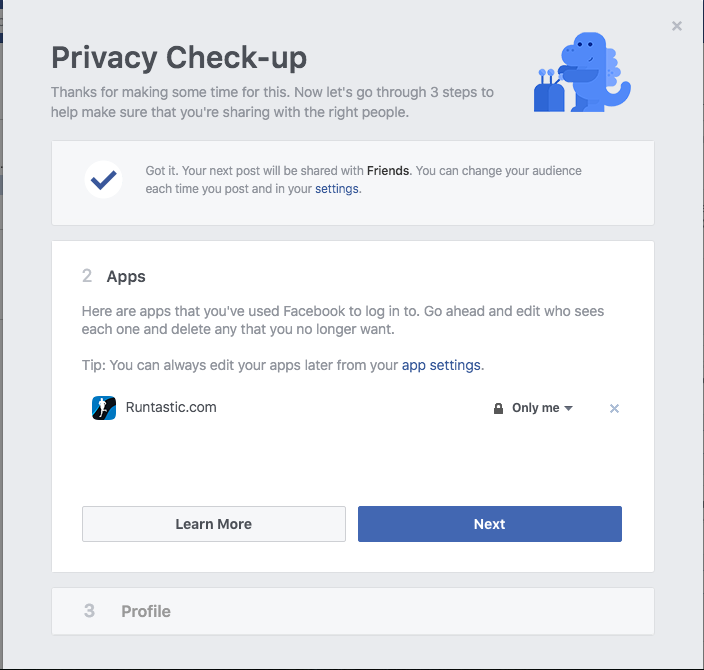 You handled a lot of this with the Privacy Checkup, but in the Settings section there are additional controls for the apps where you’ve logged in with Facebook. Click on each app to view the information that it is collecting from your Facebook profile – your public profile, as well as things like your friends list, date of birth, pages you like, and more. Here you can tweak which of these pieces of data can be collected (except public profile, which is required by all apps). You can also remove the app entirely from the main screen by clicking the ‘X’, however, that doesn’t delete the information the app already has about you. For future app logins with Facebook, it’s wise to set what info the app can collect – when signing up for the first time, click “Edit This” to choose which data you want to share. Facebook Platform provides third parties access to personal data you share with Facebook. It's how Cambridge Analytica, the company was recently suspended by Facebook while under investigation for election interference, was able to access the data of more than 50 million users in 2014. Facebook Platform also enables third parties you engage with to collect information on your Facebook friends. Disabling Facebook Platform means you’ll no longer be able to login to websites, mobile games or applications using Facebook or see app requests from friends, but you’ll still be able to use apps and play games on Facebook and elsewhere. 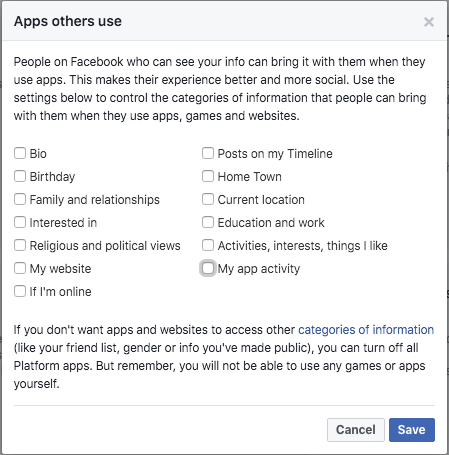 If you choose to keep Facebook Platform enabled, you can limit your exposure by selecting the data that apps that your Facebook Friends use can access. When your Facebook friends use certain apps, those apps access your public information and more. See the full list in the image to the right. There's quite a bit you may not be comfortable sharing without your knowledge. Most of it is enabled by default. Be sure to go through the list and check off what you don't want shared. Note that your public profile info, friend list and gender is not on this list - but these are shared with your friends’ apps (unless you turn off Platform, above). If you’re lucky enough to have people hanging off your every post, you can decide to widen your net of followers here. Friends follow by default, but you can change it to the only other option - let Everyone view your public posts (you can set public-ness each time you post). targeted advertising. Here you can see what information is influencing the ads you see, on Facebook and around the web. Under About you, you can turn off whether details such as your relationship status, education level or job title can be used to target advertising to you. However, this does not stop Facebook from using this information to categorize your profile for advertisers, or from ads being shown. 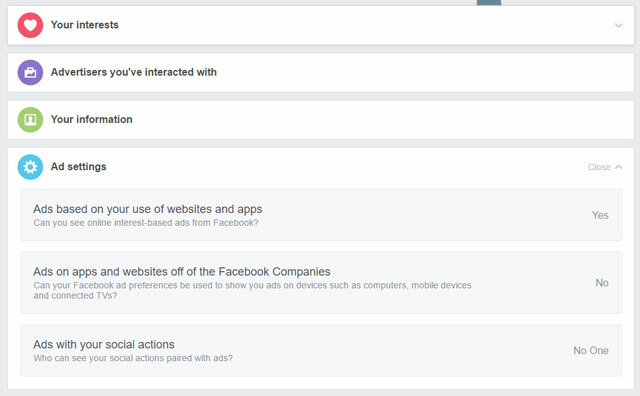 Want to know who exactly Facebook’s advertisers think you are? Click here to see what descriptors that your activity on Facebook and outside has revealed about you. Most of my fields were related to factual items such as “Gmail Users”, though there were a couple interesting deductions too, such as “Early technology adopters”. You can delete them all to start afresh, or if you want no interest-based ads on or off Facebook. Just click the X on the right of each item. Ads based on myour use of websites and apps Thanks to the Facebook “Like” buttons littered around the internet, and snippets of code that mean non-Like-enabled sites are still reporting movement back to Facebook, nearly anywhere you click online is used to build a profile of you that Facebook can then sell to advertisers so they can show targeted ads to you while you’re browsing Facebook. If that makes you uncomfortable, you can turn it off here. You’ll still see advertising on Facebook, it just won’t be based on all those steam mops you were looking up. Ads on apps and websites off of the Facebook Companies Since Facebook operates its own ad network of sites, it can also target you with ads even when you’re not browsing Facebook – essentially, at any site that uses its ad technology. But the permission is trickily worded – it asks if it can use your Facebook ad preferences, so choose Yes and make sure you review the section below entitled Ad Preferences. 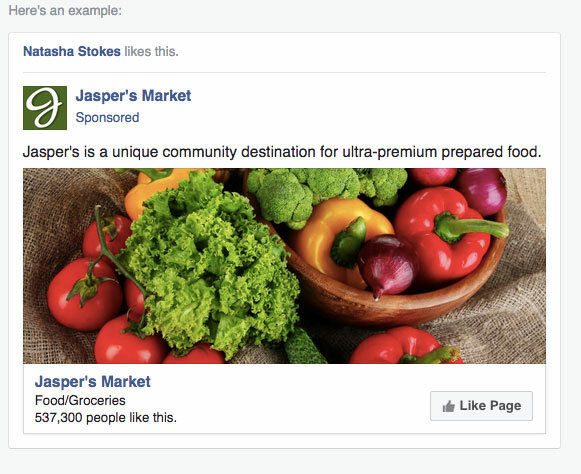 Even if you’ve always turned off targeted ads based on browsing (above), Facebook can use information on your profile, such as Likes, to create ad preferences. Regardless, you’ll most likely still receive targeted ads outside Facebook that are based on your age, gender and location, as well as browsing activity on sites that are part of other ad networks. If you want to stop seeing-based ads in general, you can opt out at the Digital Advertising Alliance - though it notes that the opt-out can only apply to participating companies. If you like, comment on or share a Page (say, owned by a business or brand), Facebook can broadcast it as an advertisement to all your friends. This also applies to apps used (for example, Spotify) and events joined (say, if you hit attend for a café’s Veggie Fridays). You can flip the audience for all this between Friends and No One. That covers your privacy setting options on Facebook. If you want to dig in even further, Facebook has a page explaining the basics of Facebook privacy tools as well as Facebook's latest data policies. Very useful guide, especially the part about App Privacy. Thanks for pointing that out. I post a lot to help market shelter and rescue dogs. I always want them to be public. I have checked the settings multiple times and I have everything chosen as public. However, about 50% of the posts only show up to me or a few of my friends, If I go to the “Who can see my stuff”, it says public, but when I to the section that provides a “view of what people see when they look at my timeline”.....half of the posts do not show up. I see them, but 90% of my friends or public do NOT. Reminder: I have my privacy settings set to allow Public….all. It’s very frustrating and I have checked the settings a dozen times. Can anyone help me figure out what I’m doing wrong?? Thanks. If you’re not seeing the posts in your public view of your timeline, make double sure that the individual posts are set to “Public”. However, even if everything is set to Public, Facebook won’t show all of you posts, even to your friends. The Facebook algorithms only show a subset of your posts based on how “interesting” it thinks they are likely to be. The more people have interacted with your posts in the past, and the more engagement a post gets, the more likely is to get shown. What’s the point of posting or not posting if the people you were intending on seeing it, may or may not see it, depending on who Facebook decides can see what you posted? Hello! My name is masum billah and I am Bangladeshi . If you help me I will be grateful to you. My problem is. How do I stop frind request? Thank you. Thank you for the comprehensive security guide. Unfortunately, it is too late for me since deactivated my FB acct over a week age with expexctations of my acct being terminated by FB after two weeks. After much deliberation I decided to stop using FB due to so many fake news stories, negative over argumentative name calling trolls who could not have an adult conversation without abrasive ad hominem names and labels. Then the breach deliberate/apathetic breach was allowed to happen being the last straw. I choose to be unplugged because FB was becoming too stressful and no longer fun. Thank you for this information. Do you really answer questions, please? I posted something to someones business page, but others don’t seem to be able to share it. How do I change that? I tried to post on friends timeline who asked me to and I got blocked on that and others. What settings should I have to post on friends and they can share it? Do you know how I can stop my friends from seeing my posts to business pages in their own news feeds? Since you don’t control the privacy settings on business pages you don’t control, you can’t limit whether Facebook chooses to show those posts to your friends. However, if your friends use the dropdown in the news feed posts to “Hide all from [name of business page]”, that should stop them from seeing it in the future. In your Timeline and Tagging Settings on Facebook, there is an option to review posts you’re tagged in before they appear in your Timeline. If you have that on (and you probably should to control what appears), you’ll need to review and manually approve before it shows up. Recently someone saw a status I posted, even though I did not include them in the list of people I wanted to be able to see the post. He saw it because he is friends with one of the approved people who commented on my post, and it showed up as “[name] commented on a post” in the unapproved person’s feed. Is there a way to ensure that other people’s comments on my posts are treated with MY privacy settings, and not the commenters’ settings? Thanks! Are you sure you didn't tag it with 'Friends of friends"
WHat privacy setting did you use for the post? Are you sure it wasn’t set for “Friends of friends” or “Public”? Also, if you tagged someone in a post, they will be able to see it, even if they are not included in the privacy settings. Who can see my response? My friends can see when I respond to someone else’s post, even when they are not friends with each other. Like “[name] commented on a post” from previous post. I have noticed that some of my friends can even comment on another (not mutual) friend’s post after I have commented. Can I stop that? If the person who made the post set the privacy to Public or Friends of Friends, then your friends may get a notification when you comment on it. And no, you can’t stop that from happening. I posted some pics of my child and tagged the people who were with us when the pics were taken (this was a year ago). Just yesterday I see a person I don’t know “Liking” all my kid’s photos. This freaked me out. I went to the post & noticed I had indeed used a custom setting “Friends” and had unchecked the box allowing friends of those tagged from viewing before posting. What went wrong here? I’m really freaking out, some of my friends & family use the same FB page for business & pleasure meaning they, themselves don’t know who is viewing their posts or posts they are tagged in. HELP. I have tried many of the site for this information but after lots of searching i was still not able to collect the comprehensive help on this problem. Your page did it very amazingly and the information here was stunning. Thanks a lot for sharing. When posting pictures, if I without the privacy to a select group of friends, yet select it as viewable to friends of those tagged, and some of those on my restricted list are friends of those tagged, will those people be able to see the pictures? I'm not sure I fully understand your question, but think "yes"
If I understand correctly what you’re asking, you want to post a photo that is set to only be seen by a specific group of friends. But, if you tag your friends, will their friends be able to see the photo, too? The answer is “yes”. If you tag someone in a photo then their friends will be able to see that photo. According to Facebook, if you don’t want your photo, post or other content to be visible to the friends of the person tagged, you can turn this setting off for each post when you post it. To do this, click the audience selector next to the story, select Custom, and uncheck the Friends of those tagged box. Thanks for your response—I understand that, but let’s say some of the friends of those you tag in your picture are on your limited profile view. Will those people still be able to view the picture even if you restrict them, because you set the photo visible to friends of those tagged and they are a friend of a tag? I know Facebook is using my contacts email addresses and phone numbers to suggest friends despite having set every privacy setting possible. I’ve explicitly removed contacts and set it not to import them. The proof came today when I added a coworkers cell and personal email and then called and emailed them. Then lo and behold, they appeared as a suggested friend. In the Facebook app on your phone, there is a setting called “Continuous Contacts Uploads”. See if that is set to Off. Otherwise Facebook will continuously upload your address book and suggest them as Facebook friends. I want to turn off the time ive been away from facebook/messanger I dont want anyone knowing that im actually on facebook/messanger how do I do this? Your guide has been tremendously helpful, thank you for putting it together and making it public. My question relates to the one from Ray. Is there a privacy setting I can select to prevent me from appearing as a ‘suggested friend’ in non-friend’s feed? This is particularly frustrating as I try to keep my FB account siloed and personal from my professional contacts. Facebook doesn’t give you the ability to stop your name from appearing in “suggested friends” lists. The best you can do is limit who can send you friend requests to “friends of friends” in your privacy settings (far from ideal, I know). That said, as long as you keep your privacy settings as “friends” for all your posts, no one will be able to see anything on your timeline unless you have friended them. I have a friend who is adopted. He knows his birth siblings and birth mother and is friends with them on facebook. His adoptive parents want to join facebook but are relying upon my friend (and I) to get them on as they aren’t very tech savvy. The problem is that the adoptive parents know the names of the members of the birth family. We’re trying to figure out how to shield the birth family from the adoptive family because if the adoptive family finds out they will be crushed and their relationship with my friend will be destroyed. There are so many ways that someone can stumble on a connection through Facebook - from viewing friends list, to seeing suggested friends, to seeing items other have posted in your timeline, or photos where you’ve been tagged - that trying to maintain two separate groups of friends who never cross will be nearly impossible. That said, I’m surprised that this is as big an issue an issue as your friend thinks it is. It’s perfectly natural for someone who is adopted to want to know more about their birth families. He’s obviously been friends with his birth family for some time and that hasn’t impacted his relationship with his adoptive parents. They raised him and, presumably, he loves them as though they were his natural parents. I didn’t love my first child less, when I had my second and third kids. This sounds like a situation where the solution may lie in open communication, not technology. Thanks for getting back, Josh! Thanks for getting back, Josh! I actually agree with you - alas technology can’t solve everything. Recently, but only on my mobile devices, I’ve been bombarded by “suggested apps/pages/posts” I see nearly as many of these as I do friends posts. My family and friends aren’t having this problem - just me! I’ve tried reporting as spam/harassment etc to FB but they still keeps showing. I’ve followed your steps and deleted all of my “liked” pages, time will tell if this works. Any help or ideas would be most welcome. Yep, lots of suggested whatever ads on mobile (but not nearly as many online, oddly). You’re already taking the right steps to delete your liked pages and interests, because that’s what many advertisers use to target their messages, but there’s no way to eliminate it completely. You could try setting your birth year to the 1800s in your profile, so you won’t be picked up by any advertisers targeting by age (except those promoting products for centenarians). How do I prevent a friend from removing my tag of him from my post? His girlfriend keeps removing my tags of him. I want to prevent anyone from removing my tags of them from my posts. How do I do this? You have control over where you are tagged on Facebook to help protect your privacy. Others can’t force you to be tagged if you don’t want to be. Liking posts is causing problems. Lately I’ve noticed that things other people have pressed like on has been popping up on my FB. And the things I press like on have been popping up on my friends and families facebook, is there any way to restrict that? I will sometimes thumns up things that I wouldn’t want my friends and family to see, like political views Ect. Please help! You actually can edit the privacy settings for your likes, but not through your Privacy Settings (because that would be too obvious). Instead, go to your Timeline and scroll down to where your likes are (or, using the menu at the top of your Timeline, click More and then Likes). You’ll see a little edit button in the top right corner - click that and select Edit Privacy. From there, you can edit the privacy settings for each category of your Likes, but not for individual likes. And, since you don’t know what category Facebook is assigning to a particular page, you can’t be sure which privacy settings will apply to it. Therefore, if there are things you would rather others not see, it’s safest just not to Like them. Hi, I wanted to set up a custom setting under “Edit Privacy of Likes”. When I select to set up the Custom setting I see the note “Anyone tagged will be able to see this post”... does that mean when I like a page it will tag those people or ONLY the people that I add to this custom setting will see this on their timeline AS WELL as anyone I chose to tag? Thank you! 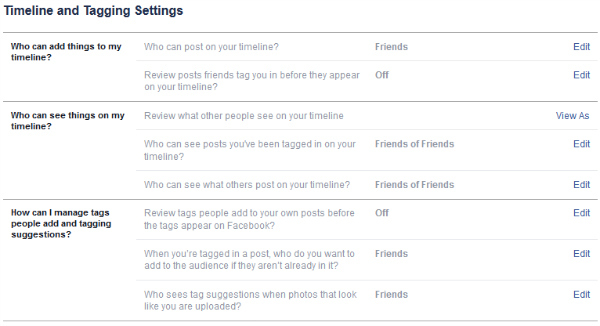 What I described is how to set privacy settings for pages you Like. For posts you Like, that’s a different story. Those privacy settings are determined by the poster, not the Liker. So if you have mutual friends or the post is set to Public, others you know could see your Like, too. There is no way to prevent this other than not Liking. Hi, iI have set the option to REVIEW when others post on my timeline or tag me in photod, and it generaly works, the problem was that today a friend shared on my wall an old post that Facebook told her was from a year ago that we shared together and I WAS NOT GIVEN THE OPTION TO REVIEW this post… Since it is already on my wall for all my friends to see I cannot simply hide it, or else she might feel hurt. I would simply like to change THIS particulary Post so that ONLY SHE and I can see it on my wall, but to hide it from everyone else, the same way I can to when I publish my own posts. You can’t change the privacy settings for individual posts from others - it’s either on your timeline or not and uses your timeline privacy settings. But if you don’t want others to see it, hide it from your timeline. She didn’t ask you before she posted it, you don’t need to feel bad for removing it. If you had previous posts using custom settings, but then removed the customization for your most recent post, can those people (whom you had previously not allowed to see those customized posts) now see your old posts? Your article touches on limited posting seemingly for the general public but I have used it for specific people in the past and I can not find it now to remove it . How To Hide Family Members in "about"
I can’t seem to find how to hide my family members in the “about” section on Facebook. There seems to be people out there that will contact family members as retaliation for disagreeing in a comment section on the web. Thanks. You can’t change your privacy settings for Family & Relationships as a whole, but you can change it for individual relationships. Go to the Family & Relationships section of your profile. Highlight a specific relationship with your mouse, ad you’ll see an edit button appear in the upper right corner. Click on that and you can save the privacy settings for that relationship. FWIW, I’ve never heard of someone contacting family members in retaliation for comments on the web, but if that’s a concern for you, that’s how you fix it. Thanks, Josh! I really appreciate you getting back with me. Your advice certainly did the trick. Application for determination of the most active page and group subscribers on Facebook. Rating is based on likes, comments and shares that fans do on community pages per month, year or a chosen period. I was commenting on a publicly posted news article, and engaged in a dialogue with another user. He was consistently using @myname to created a link back to me in his comments, but I am unable to do this with his name. Facebook recognizes it when I type @hisname, but when I hit post, no link is generated. I’ve poured over facebook settings to find where I can turn “mentions” off for myself (like this stranger apparently has done), but I can’t find anything. I have come across a third-party app called Mention Blocker which is a chrome extension. Is it possible he is using this? or is this just a setting in FB somewhere that I can’t find? PS - I had a friend on a different computer in another state try the same thing on the same thread, and he also couldn’t successfully make a mention of this person in a comment.